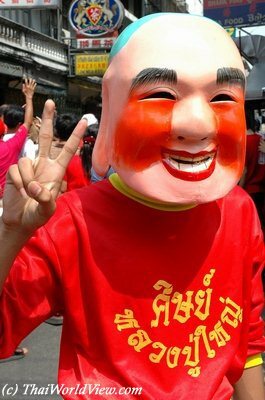 The Chinese New Year's Day is said "WAN TRUT CHIN" - วันตรุษจีน in Thai language. Chinese New Year festivities last three days. 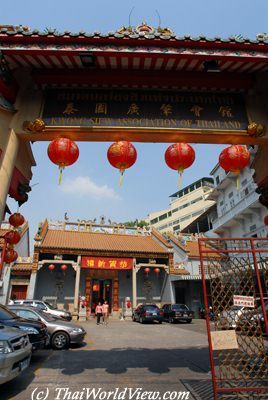 The best places to enjoy Chinese New Year in Thailand are Bangkok's chinatown Yawarat district and Nakhorn Sawan. Bangkok's Yawarat district was founded in year 1783. 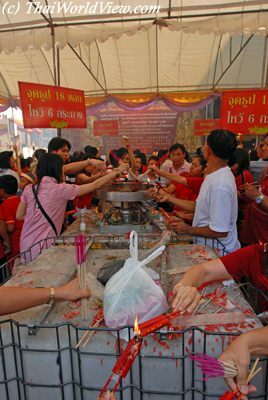 On the day before the Chinese New Year's Day, Thai Chinese people start to make offerings to gods, their ancestors, the God of Land and the God of Luck. Offerings include steamed duck, chicken, pork heads, fresh or canned fruit, chinese cakes (often with durian) and vegetarian food. Chinese flowers ("DOOK MAI CHIN" - ดอกไม้จีน) and golden paper are also offered. Placing a full chicken (representing prosperity and wholeness) behind mandarin oranges (representing wealth and good fortune) has a full symbolic signifiance when setting the diner table for ancestors and the household spirit. 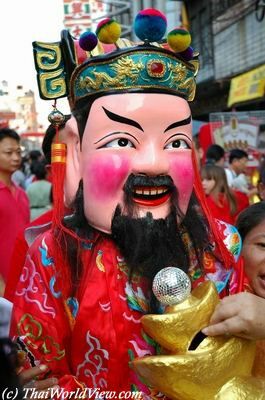 The Chinese God of Wealth, Choi Sun, appears during the Chinese New Year festivities. 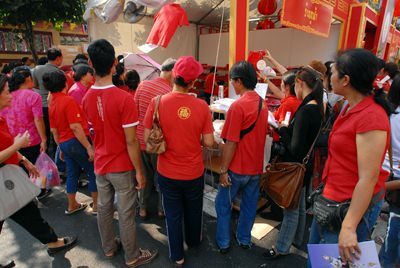 He is spreading good luck and handing out red envelopes ("ANG PAO") as gifts. The entire house should be cleaned before New Year's Day. On New Year's eve, all the brooms and brushes are put away. Sweeping and dusting isn't done for fear that good fortune will be swept away. At midnight doors and windows shall be opened to allow the old year to make exit. Anyone shall not borrow and lend anything on New Year's day. The Lion dance is very popular during Chinese New Year festivities. The lion is a huge, multi coloured papier-mache head with a long multi colored train. Two people are inside the lion. They are moving the head and body with precision and ease following the background drum beat. The lion shows every emotion, from happiness and joy to the deepest sorrow. 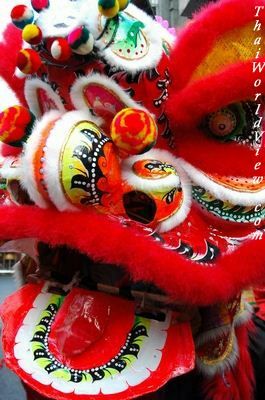 It is lucky for the lion dance to visit personal home or business. Local businessman use cabbages or lettuce dangled outside shops to attract the lions to visit their premises. It is especially lucky if the lion decides to put the owner head in its mouth. Accompanying the lion dance procession, there are specially percussionists using drums. Their drums represent the lion's heartbeat and must be continuously played as the lions dance or move from one location to another. People thank the lions by giving a fee. This smiling person is always followed by the lions during festivities. Normally he is holding a fan. The lions move from one shop to another and perform the dance. In some case, the performers raised a pole. 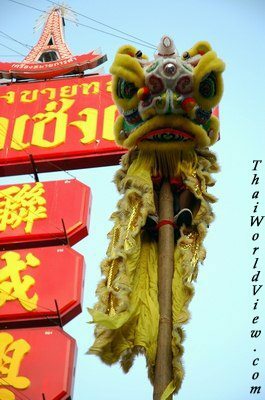 The lion climbs on the top of the pole and performs a dance or gets red envelopes ("ANG PAO") given by people located on buildings with higher floors. 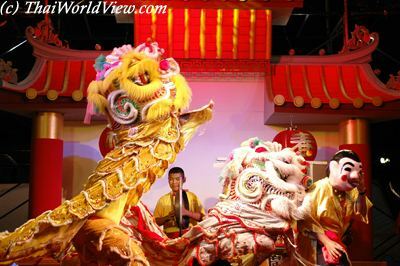 The more the spectators pay the lion dancers, the better the performance is. The lion dance is believed to ward off demons. During Chinese New year, in Bangkok's Yaowarat district, visitors can enjoy many cultural shows related to Chinese culture and history. Wearing red clothes is believed to bring blessing. Gold colour is also popular auspicious colour. 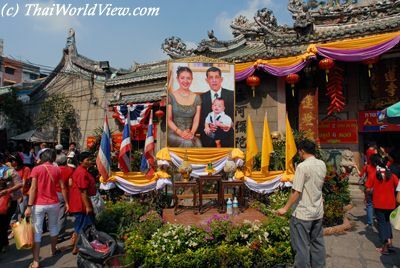 Her Royal Highness Princess Maha Chakri Sirindhorn presided over the Chinese New Year Festival official opening in year 2009. 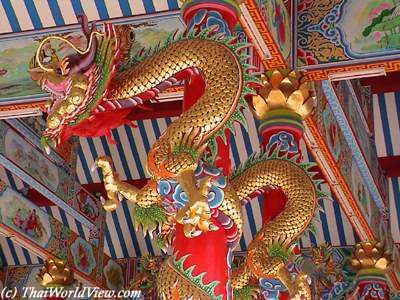 The Wat Mangkon Kamalawat (วัดมังกรกมลาวาส) is the largest and most important Chinese Buddhist temple in Bangkok. 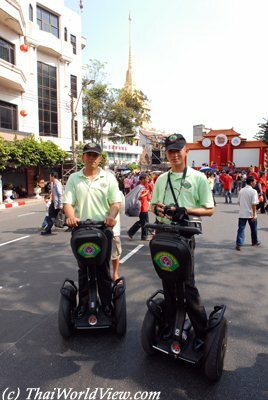 The Tourism Authority of Thailand hold every year the Chinese New Year Festival at Chinatown on Yaowarat road during two days in Bangkok. Thai-Chinese descendants nationwide are worshipping the gods and praying to their ancestors during the Chinese New Year Festival. 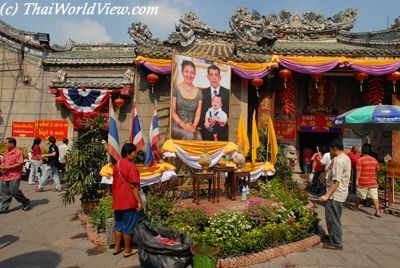 Thai-Chinese people present offerings to different shrines in Yaowarat district in Bangkok. Yaowarat district is very busy during Chinese New Year festival. Many traffic jams happen as some streets are closed during the festival. Yaowarat main street is closed to car circulation during Chinese New Year festival. The main street is busy with many stalls.